Summary: John's Brown raid on Harper's Ferry took place on October 16, 1859 in the town of Harpers Ferry in Virginia (now West Virginia). The militant anti-slavery activist led a group of 21 armed men to seize weapons and ammunition from a federal armory at Harpers Ferry, enough to equip an army, and then lead a slave rebellion in the South. In the battle for the arsenal John Brown was captured by U.S. marines led by Colonel Robert E. Lee and and Lieutenant J.E.B. Stuart. He was tried and found guilty of murder, treason, and inciting a slave insurrection. He was hung on December 2, 1859, but his name was immortalized in the song "John Brown's Body Lies A-Mouldering in the Grave". Where was Harper's Ferry? Harpers Ferry was a town in Virginia that housed a United States Armory and Arsenal. Harpers Ferry was strategically located close to the Mason-Dixon line, or the border between the free and the slave-holding states. In 1794, President George Washington had selected Harpers Ferry, Virginia, and Springfield, Massachusetts, as the sites of the new national armories. The Armory and Arsenal at Harpers Ferry employed 400 men who manufactured rifles and other mechanized arms for the U.S. Army. The Armory and Arsenal consisted of 20 workshops, two arsenal buildings, a foundry and 86 dwellings. Around 100,000 weapons were stored at the US Armory and Arsenal. John Brown's Raid on Harpers Ferry for kids: What's the difference between an Armory and an Arsenal? Harpers Ferry National Armory was both an arsenal and an armory. Why did John Brown raid Harper's Ferry? The goal of John Brown was to seize all of the weapons at the Armory and Arsenal at Harpers Ferry in order to arm anti-slavery militants. The massive cache of arms would be used to arm men involved in further insurrections (rebellions). John Brown had been involved in the violent border war known as "Bleeding Kansas" during which he had received considerable publicity. The national economic depression, caused by the Panic of 1857 made it difficult to raise funds for the militant anti-slavery activists. If he could seize the weapons he could equip an army. He would be able to lead a slave rebellion in the south. His intention was to also establish a stronghold in the Southern mountains which could be used by fugitive slaves on their hazardous journey to freedom. John Brown's Raid on Harpers Ferry for kids: The "Secret Six"
The funds for John Brown's Raid on Harpers Ferry were provided by a group of anti-slavery abolitionists, that were referred to as the "Secret Six". The identity of these backers was later discovered in correspondence kept by John Brown. John Brown had attracted a great deal of media attention following his actions in "Bleeding Kansas" and became a prominent member of the Abolitionist Movement and he was introduced to influential abolitionists in the Boston area who later became known as the members of the "Secret Six." The "Secret Six" agreed with the militant sentiments that slavery would not die a peaceful death. The "Secret Six" also realized that a daring raid would also attract nation wide publicity for their cause. The names of the "Secret Six" were Franklin Benjamin Sanborn, Thomas Wentworth Higginson, Samuel Gridley Howe, Theodore Parker, Gerrit Smith, and George Luther Stearns. None of the "Secret Six" were brought to trial following the raid on Harpers Ferry. Prior to John Brown's Raid on Harpers Ferry he rented a farm, 7 miles from the town of Harpers Ferry. The farm acted as his base as he was preparing for the raid. He even arranged for his wife and one of his daughters to join him for a short while in order to allay any suspicions about his activities. Over a period of time his followers joined him at the farmhouse, keeping out of sight and being trained and drilled for the raid on Harpers Ferry. The "Secret Six" had funded the proposed raid, ensuring that all of the followers were equipped with the necessary firearms. Twenty-one anti-slavery men were involved John Brown's Raid on Harpers Ferry, including three of his sons, Oliver, Owen, and Watson. Three of the followers were free African Americans, one was a freed slave and another a fugitive slave. At this time in US history assisting fugitive slaves was illegal under the Fugitive Slave Act. 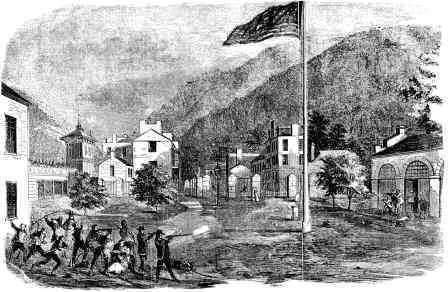 The Raid on the Armory and Arsenal at Harpers Ferry took place on the Sunday evening of October 16, 1859. His "army of liberation" seized the arsenal and armory and cut the telegraph lines to prevent word of their raid reaching Washington, D. C. However, the raiders detained a Baltimore and Ohio train at Harpers Ferry but then made the mistake of letting it continue its journey.When the train reached Baltimore the next day the conductor contacted Washington who dispatched Colonel Robert E. Lee and 100 marines by train to Harpers Ferry. Meanwhile the raiders had taken over the arsenal and taken hostages. The local militia were the first to become involved in the Battle of Harpers Ferry, aided by the townspeople. Part of the plan was the assumption that local slaves would join the raiders, but this failed to happen. John Brown and his followers had their escape route cut off by the militia who surrounded the Armory and Arsenal at Harpers Ferry. The raiders took nine of the hostages and moved to the armory's small fire engine house. On Tuesday, October 18, Colonel Robert E. Lee ordered Lieutenant Israel Green and Lieutenant J.E.B. Stuart and their men to storm the engine house. The engine house was taken and the Marines began taking prisoners. Five raiders escaped during the battle and were never captured. Ten of the raiders were killed by the militia. During the battle Lieutenant Israel Green seriously wounded John Brown with his sword. 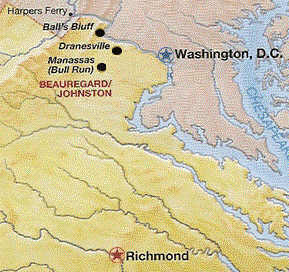 The surviving raiders were taken eight miles to the prison at Charles Town. On October 26, 1859 John Brown, still recovering from a sword wound, stood trial at the Jefferson County Courthouse. Armed guards and cannon surrounded the courthouse. He was accused of treason, inciting a slave revolt and the murders of George Turner, Fontaine Beckham, Thomas Boerly, Heyward Shepherd, and Luke Quinn. After hearing the charges, John Brown said "If you want my blood, you can have it any moment, without this mockery of a trial." The courthouse was packed with 600 rowdy spectators and many newspaper reporters. The injured John Brown, except when forced to rise, lay on a camp bed. He asked for a delay in his trial but the motion was denied. He pleaded "not guilty" to all the charges. The name of the presiding over the trial was Judge Andrew Parker. The name of the prosecutors were Charles Harding and Andrew Hunter. The Charlestown lawyers Thomas C. Green and Lawson Botts were appointed defense counsel for John Brown but replaced, at Brown's request, by lawyers Samuel Chilton of Washington, DC, and Hiram Griswold of Ohio. On October 31, the jury found John Brown guilty on all counts of murder, inciting a slave insurrection and treason against the Commonwealth of Virginia. On November 2, 1859 Judge Andrew Parker sentenced John Brown to death by hanging. Following additional trials, Shields Green, John A. Copeland, John E. Cook, Edwin Coppoc, Aaron D. Stevens and Albert Hazlett were also hanged for their part in the Raid on Harpers Ferry. John Brown was sentenced to death by hanging by Judge Andrew Parker on November 2, 1859. 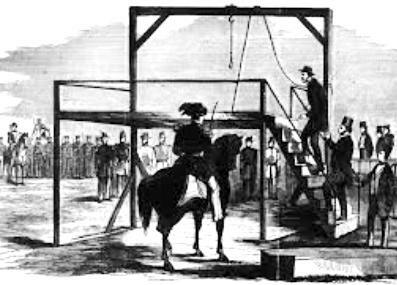 He was hanged a month later in Charles Town on December 2, 1859 at high noon. The scaffold was prepared in a field on the edge of Charlestown. The route to the place of execution was guarded by troops and cannon and strangers were prohibited from entering the town. The scaffold itself was completely surrounded by soldiers. The hanging of John Brown was witnessed by only a few. Admittance to his hanging was severely restricted, due to fears that attempts would be made to free him. Newspaper reporters were however, allowed to witness the hanging and gruesome details were reported by the media. According to one reporter at the scene his "body jerked and quivered" for a full five minutes. His body was claimed by his wife, Mary Brown and he was buried in North Elba, New York. The info about John Brown's Raid on Harpers Ferry provides interesting facts and important information about this important event that occured during the presidency of the 15th President of the United States of America. The following John Brown quotes provide an insight into the beliefs of this famous, albeit misguided man, who lead the raid on Harpers Ferry. "Slavery is a state of war." "Talk! talk! talk! That will never free the slaves. What is needed is action-action." without this mockery of a trial." "I, John Brown, am now quite certain that the crimes of this guilty land will never be purged away but with blood." "If you die, you die in a good cause, fighting for liberty. If you must die, die like a man." I say let it be done." The highly emotive words in the speech of John Brown were faithfully reported by the newspaper reporters and read across the nation. He was subsequently regarded as a martyr by many of the Abolitionists in the North but a traitor by the south. His prophetic quote "...that the crimes of this guilty land will never be purged away but with blood." was remembered when the American Civil War erupted on April 12, 1861, just 16 months after his death on December 16, 1859. The famous song "John Brown's Body Lies A-Mouldering in the Grave" originated from the words of soldiers of the Massachusetts 12th Regiment. The catchy song become a popular anthem of Union soldiers during the Civil War and commemorated his life, belief and actions from the anti-slavery point of view of John Brown's Raid on Harpers Ferry. The article on John Brown's Raid on Harpers Ferry provides an overview of one of the Important issues of his presidential term in office. 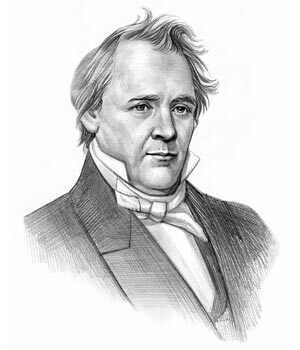 The following James Buchanan video will give you additional important facts and dates about the political events experienced by the 15th American President whose presidency spanned from March 4, 1857 to March 4, 1861.